The word Husk refer to the shell or leafy covering some fruit or vegetable which must first be removed before eating the meat inside. The exterior of a coconut or corn can rightly be called husk because, you cannot eat it's covering. But we cannot called husk the covering of a Mango, because it covering can be eaten alongside the meat. 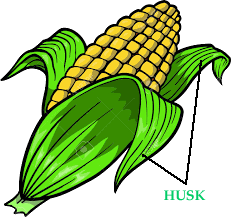 Husk refers to the inedible covering of a fruit or vegetable. We have more content to share with you. Just join our Newsletter or submit your email address below to get them.